I think this is the first time I voted in a Primary. This year, it could not have been more convenient. 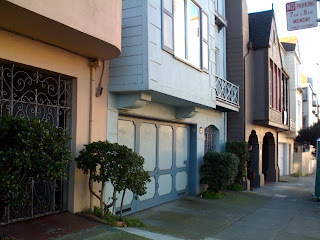 I walked out my front door (the gate on the left in the photo below) and walked two doors down to the polling location (the garage of the brown house). Yes, I voted in someone's garage. Does this not seem peculiar to anyone else? I've always voted (when not in college, traveling, etc) in a city hall, fire station or the like. A private garage just seems odd. Oh, well, no one ever said California was normal. It wasn't the easiest action, however, as I guess the DMV's portal into the registry of voters is not all that seamless. My change of address via CA's DMV website in November did not translate into an update of the registry of voters. Hopefully my pink envelope of address change will get counted. 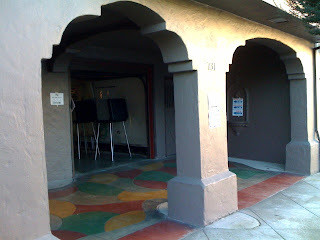 I remember when we lived in southern California (I was really young) our neighborhood polling place was in the garage of one of my best friend's house. So when my parents went to vote, they always took me along and I got to play Nintendo with my friend!